Ghouls are a stable of post-apocalyptic gaming. 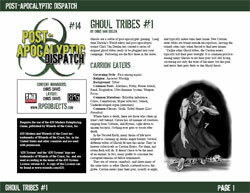 Long time Darwin’s World editor and post-apocalyptic author Chris Van Deelen has created a series of original ghoul tribes ready to be plugged into your campaign. Following are the first three in the series.